Tidak terasa akhir semester 2 sudah dekat, teman-teman semua pasti tidak sabar menunggu kenaikan kelas.Untuk mengatasi kecemasan kalian dalam menghadapi Ujian Kenaikan Kelas nanti kami ingin memberikan Soal UKK Bahasa Inggris SMP Kelas 8 ini agar teman-teman semua mendapatkan nilai yang bagus pada semester 2 kali ini. Untuk para guru juga, kami sangat senang jika artikel ini dapat membantu dalam pembuatan soal UKK di sekolah bapa dan ibu guru sekalian. Silahkan disimak soal latihannya dibawah ini yaa. Untuk mengunduh soal, silahkan scroll terus ke bawah. Animals are widely used in laboratories. Mice, rabbits, dogs, and monkeys are a few examples of animals used by researchers and scientists for scientific and medical purposes. Scientists use the animals to investigate biological processes in humans and animals, to study the causes of diseases, to test drugs, vaccines, and surgical techniques, and to evaluate the safety of chemical used in pesticides, cosmetics, and other products. Many chemical functions like human so that they can be good models to understand the human body. Some animals suffer from the same diseases as humans do. Animals also carry a number of genes that are identical to human genes. With those similarities, scientists are able to learn much about the human body by studying the animals. 1. What do researchers and scientists do in laboratories? 3. "...............so that they can be good models to understand human body." What does the bold typed word refer to? 4. Based on the text, why do the scientists use animals for their experiments? Hi! My name is Dian Wahyu Dinata. I’m the winner of an English Poetry Reading Competition in Sempu. I live in Maron. I was very happy to meet Sue and Ayu on early February 2008. I’m very comfortable speaking English with you. I have one question for Kang Guru when I can invite KG to our school in SMP Genteng. 6. Who is the winner of an English Poetry Reading Competition in Sempu? 7. When did Dian met Sue and Ayu? 8. Which statement is TRUE based on the letter above? 9. Rika : Can you help me to get some food? Santi : Yes, of course. The italicised words is an expression of . 10. Rani : What's your opinions of the disasters, that keep happening in our country? 11. Lia is 15 years old. Ami is 16 years old. It means Lia is..........than Ami. 12. There is..........big garden in my city. 13. .......... is your school? 14. .......... does the test begin? Questions 15 to 21 are based on Text below. I was in the park with my older sister, Cathy, on Friday. My sister left her jacket on a bench while we talked to some friends. When we went back to the bench, a girl in a red T-shirt was sitting there. She had some money in her hand. When she saw us, she got up and walked away. Cathy looked in her jacket, but her money was not there. “That girl stole it!” I said, and we all ran after her. We caught her quickly. My sister was very angry and she said, ”Give me the money!” The girl gave the money to Cathy and ran away. We all ran after her, but we lost her. So the girl in the red T-shirt was not a thief! She probably thought we were thieves! We felt terrible. Please telephone us if you know this girl. We are very sorry for our mistake. We would like to say sorry to her and give her money back to her. Our number is 512667. My name is Anna. 18. Cathy's...........was really at home. 20. Anna and Cathy..........the girl. 21. They want to..........to the girl. I had a terrible day yesterday. First, I woke up an hour late because my alarm clock didn't go off. Then, I (22).......... in such a hurry that I burned my hand when I was making breakfast. After breakfast, I got dressed so (23) .............. that I forgot to wear socks. Next, I ran out of the house trying to get the 9:30 bus, but of course I missed it. I wanted to take a taxi, but I didn't have enough money. Finally, I (24) ............... the three miles to my school only to discover that it was Sunday! I hope I never have a day as the one I had yesterday. 26. Arrange the following sentences to make a good paragraph . 1. Jack had an accident a few days ago. 2. Jill went to the hospital too visit him. 3. He is still in the hospital now. 4. She is at the hospital now. 5. He had to go to hospital. 1) For several days they had through the ocean with a wonderful night and days. 2) It started the voyage from Southampton England to New York USA. 3) In April 1912, about 2500 passagers and crews had a great voyage with a very great ship called Titanic “ The Unsinkable Ship”. 4) After that, the coque crashed the iceberg and the water started filled the ship. 5) Finally the unsinkable ship Titanic sank down before reaching to New York on April 15th, 1912 at 2:20 in the morning and only 700 people survived. 6) It was the greatest and the most terrible marine disaster ever. 7) Then, the unseen iceberg was suddenly appeared , Titanic could not help avoided colliding it on April 14th, 1912. A Bus can run 120km/hour. A Bicycle can run 40 km/ hour. 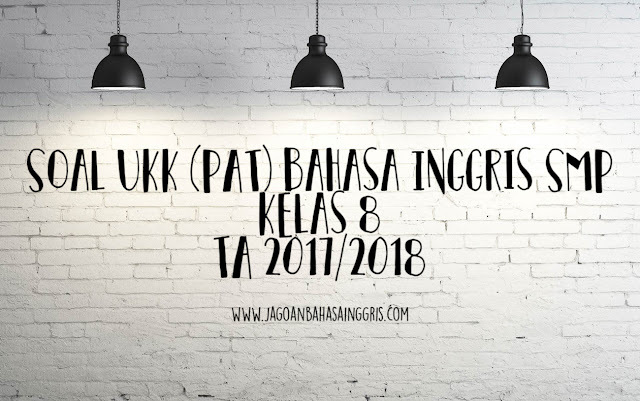 Baiklah, cukup sekian Soal UKK (PAT) Bahasa Inggris SMP Kelas 8 TA 2017/2018 semoga dapat membantu adik adik untuk belajar UKK di rumah. Thank you for reading and have a nice day!